Peter Parker’s best bud in Homecoming might have the name of a familiar comics character—Ned Leeds—but his role in the film and his appearance are far more in line with another Spider-Man character: Ultimate Spider-Man’s Ganke. Fans are confused as to why Miles Morales’ best friend is now Peter’s... and turns out, so is Ganke’s own creator, Brian Michael Bendis. I’ll be very honest right now. I have not talked about this publicly, but it feels very bizarre. Most of the time the characters that I’ve had a hand in creating that have made it to the screen, from Jessica [Jones] all the way to Maria Hill and Quake, the level of quality of the adaptation and care in which they bring the character forward past the adaptation into its new life has been uniformly amazing — my luck in this area has been second to none. I’ve not seen Spider-Man: Homecoming, so I’m gonna wait until we see what we see. But, yeah, it was bizarre and flattering. I don’t even know if Ganke was the inspiration, or they just got to their own place with a character like this on their own. I don’t know. It does seem like it might have been, but no one’s told me either way. There’s so much else in that trailer that’s from ‘Ultimate Spider-Man’ that I would assume that, yes, it is… It’s weird only because Ganke wasn’t part of Peter’s story—he was part of Miles’ story. Bendis’ own concerns match those of Ultimate Spider-Man fans—it’s not necessarily concern because Ganke’s in the movie with the name of a totally different character (Ned Leeds was actually a rival of Peter’s at the Daily Bugle, not a classmate, and even became the Hobgoblin at one point), it’s that Ganke was never part of Peter Parker’s story. His relationship with Miles Morales as one of the few confidants the young Ultimate Spider-Man has in his life formed a crucial emotional core to Miles’ story when he was first starting out. Ultimate Comics: All-New Spider-Man #25, art by David Marquez and Justin Ponsor. 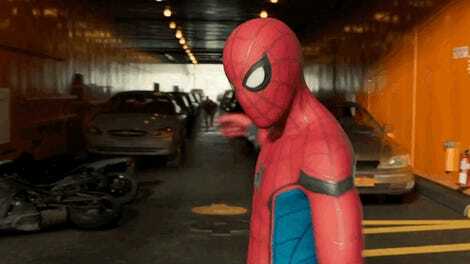 When fans of Miles were initially annoyed to see Peter Parker as the star of Homecoming, the idea of seeing Miles’ own best friend transplanted into Peter’s life stung a little. But it’s interesting to hear that it’s not just fans who feel at odds with Homecoming’s Ned Leeds, but even Bendis himself. Guess we’ll just have to wait until the animated Spider-Man movie to see Miles and Ganke together on the big screen for real.